A Islamic app by Alkama Ahmed forincreasingIslamic Knowledge, Islamic Question And Answersetc. A Islamic app by Alkama Ahmed forincreasingIslamic Knowledge, Islamic Question And Answersetc.Bug Fixes.Commenr Box Addes. Quran Reading wishes you All a Very Happy and Blessed Ramadan2017Step by Step Salah is an Islamic Smartphone application meantfor instructing Muslims all over the world about how to effectivelyoffer prayers (Namaz) along with all the essential information. Itis a comprehensive guide for believers to get themselves familiarwith every aspect of daily prayers, non-obligatory Salat andothers.FeaturesSome of the unique features of this Salat app are:•In depth illustration of each step taken during every Salat Prayeralong with Audio• Clear steps with detailed descriptions.• Easy onthe eye user interface.• Covering each and every facet ofperforming Salaah.• Different Settings options depending upongender and sect.• Share option for benefiting others with thisuseful Prayer App is also provided. Categories:The learningoutcomes of this application are divided into five major classeswith real time step-by-step method:1. Daily PrayersThis sectiontells about the nature of Rakaat (Fard or Mandatory, SunnahEmphasized or Mu`akkadah, Sunnah Gher Mu`akkadah, Nafl Mustahab andWitr Wajib) that come in each Daily Prayer for all 5 fiveobligatory Namaz, i.e. Fajar, Duhr, Asr, Maghrib and Isha.2.Occasional SalahNumber and kinds of Rakaat and differentsupplications that come in Jumma Prayer, Funeral (Namaz e Janazah),Tasbeeh (Salatul Tasbeeh), Salat al Istikhara and Eid are coveredin this category.3. PreparationIn this segment, the believers willcome to know about necessary characteristics associated withlearning Namaz rules. The learnings are spread over maintainingcomplete Cleanliness, how to perform Wudu, Covering all Body partsand keeping importance of Time of the prayer in mind. 4. MakingupThis category is all about making Muslims aware of thesignificance of carrying out Missed Salah, how to offer Qaza Namazand performance of omitted Salat under different circumstances. Italso lets user know about common Mistakes that occur during routineprayers.5. TimingsThis part is all about making app consumersidentify with the correct prayer timing for all five compulsorySalat. It tells about the actual occasion of Namaz based ondifferent information sources of current Location, Juristic (Hanfi,Shafi), Calculation methods (WML, Makkad, Karachi, ISNA, Tahran,Egypt) and Latitude (Angle Based, Mid Night, One Seventh). It alsoinforms about the upcoming Namaz instance in three different AdhanSounds.Benefits and Blessings:Benefits and blessings of prayers areincluded in separate module. Blessings of prayers cover JummaPrayers, Funeral Prayers, Tasbeeh Prayers, Salaat ul Tasbeeh andEid Prayer, All Daily Prayers. Also Significance of prayers areincluded.If you are looking for a complete guide on how to prayNamaz with step by step illustration, then download this Islamicapplication now in order to know about adequate information aboutperformance of Salah. i Muslim has features like Hijri calendar, the most accurate prayertimings based on your location, prayer time notifications and Azan/ Adhan, Qibla locator, Quran, live Quran radio, nearby mosques,Islamic wallpapers and so on. It will significantly make yourIslamic affairs more convenient and merge your life with religionefficiently.Now is Ramadan 2016 (also transliterated Ramazan,Ramzan, Ramadhan, or Ramathan)! It is the ninth month of theIslamic calendar, and is observed by Muslims worldwide as a monthof fasting to commemorate the first revelation of the Quran toMuhammad according to Islamic belief. You can send Eid Mubarakgreeting cards to your friends with iMuslim as well. This annualobservance is regarded as one of the Five Pillars of Islam. Themonth lasts 29–30 days based on the visual sightings of thecrescent moon, according to numerous biographical accounts compiledin the hadithsHighlights of i Muslim☆AUTHENTIC & CERTIFIEDSOURCES☆-Reliable and certified Islamic content sources.-Ensuringmost authentic and correct knowledge.☆MORE FEATURES LESS SPACE☆-Now iMuslim is faster and lighter than ever, taking up half asmuch phone memory as others. We significantly reduced the size ofAPK file to 8 MB. It's the smallest Muslim helper foryou.☆USER-FRIENDLY INTERFACE☆-Swipe motion technology for efficientaccess and ease of use with a flick of a finger.☆AMAZING FEATURES☆-Prayer Time & Azan / Adhan:i Muslim provides you with the mostaccurate prayer time based on your location, which is carefullycalculated by GPS.During this process, i Muslim won't upload anyyour private messages.And free for abundant Azan / Adhan.Suchaccurate Prayer Time and multiple Azan / Adhan options (for you) tochoose from. iMuslim this app will remind you every single prayertime and Azan. - Quran reader:Holy Quran with translation in 20languages and various audio recitation. You can find Quran in yourown - Qibla:When you lost your direction, qibla will help you,qibla compass to show you the direction of the Kaaba. It will showyou the direction of Mecca.- Nearby Mosques & Halal place:iMuslim provides you nearby Mosque and restaurants when you can'tfind them during trip. Meanwhile, if you installed Google Map, youcan easily navigate to your destination.- Quran Radio/FM:Listen toQuran FM around the world. Help you attach the whole islamic wolrdwhere ever you are.- Islamic wallpaper:Abundant Islamic wallpapersin different themes. Set up muslim wallpaper in your android smartphone.- Prayer time widget:You can quickly view Prayer Time inlauncher.We provide the most efficient way to do tye prayer.-Islamic / Muslim calendar:Muslim calendar to estimate holy datessuch as Eid-Ul-Fitr and Eid-Ul-Adha, Ramadan, etc- Names:99 namesof Allah. - Greeting card for Eid Mubarak 2016: Send your bestwishes and greetings to your friends in Eid 2016 using Eid MubarakGreeting cards feature,of iMuslim. More features are upcoming soon,so keep an eye on our upcoming versions of i Muslim. This is justthe beginning!Facebook:https://www.facebook.com/pages/iMuslim/705478572877661Google plus:https://plus.google.com/communities/110774675976262913772RamadanKareem and Eid Mubarak 2016! Quran Reading wishes you All a Very Happy and Blessed Ramadan2017Kids Dua Now is an interactive application for Muslim Kids tolearn & memorize the daily Islamic Duas in the easiest way. Inthis app, Islamic Duas and supplications for everyday use aretaught to children of different age groups with Word-by-Wordrecitation, translation, and transliteration method to help Muslimkids in learning the Arabic Duas easily.The app will help your kidin learning the most important Islamic duas for different set ofdaily activities such as Dua for waking up and sleeping, Dua beforeeating, drinking water and many more. The Pro Word-by-Word featurewill help the child to learn duas without any assistance as itexcellently communicates with the kid to make him interested inlearning to read, recite, and memorize the words of Duas andAzkar.The Main Features of Kids Dua Now include:Word by WordTeaching - Word by word tab shows the dua in Arabic where each wordis highlighted in a separate box, which improves the focus andattention of the kids to the individual word level. Each word isrecited separately to help kids in learning the right way ofreciting the Dua.Translation & Transliteration - Thetranslation and transliteration of the highlighted word are alsogiven separately to help the child understand the sounds andmeanings of the word.Audio Recitation - The reciter recitescomplete Islamic Dua and a highlighter scrolls through the duasimultaneously to show the word being read.Duas for Different AgeGroups - The duas are divided in 3 age groups: Group #1 (Age3-4)Group #2 (Age 5-8)  Group #3 (Age 9-12) Duas List – Each groupfurther features the duas for the particular age groupHighlighter -The Reciter recites complete Islamic Dua and a highlighter scrollsthrough the dua simultaneously to show the word being read.Full Dua- Full Dua tab of Kids Dua Now shows the complete dua withtranslation in English and Transliteration of Dua.Graphics &Interface - Kids Dua Now uses descriptive pictures to illustratethe purpose of each Muslim dua, which makes learning easy tocomprehend for the Muslim kid. In addition, the elegant interfaceprovides an easy to use experience even to the kid.CustomizeSettings – You can customize the app to change font style, fontsize, turn on & off the translation & transliterationfeatures.Note – The application is equally helpful for the Muslimconverts interested in learning the basic Islamic Duas.Rate "KidsDua Now" to help us improve our application and make IslamicLearning accessible to everyone. Thousands of best and unique Islamic names collection. Beautifuldesign and easy to use.Go to the Menu and select option from thelist alphabetically. 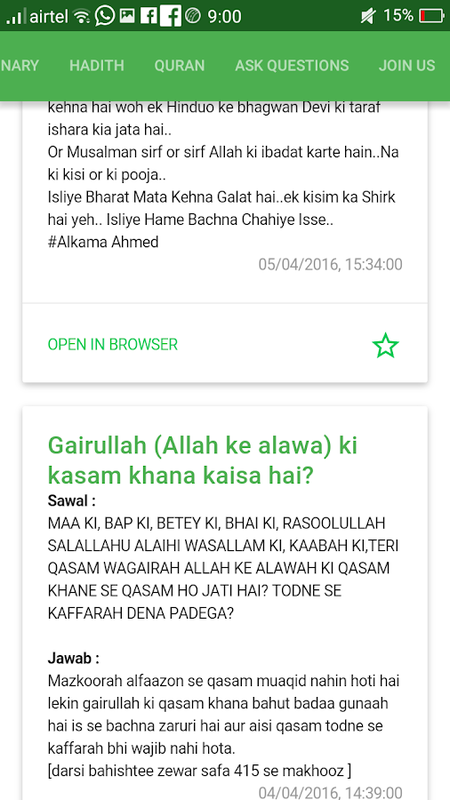 This App only contains unique Islamic names.You can also find the language origin, meaning in Urdu and Englishphrase of desired names.Details about zodiac star, Lucky number,Lucky stone, Lucky color, and planet are also mentioned for eachalphabet.